Synchronize Your Folders and Drives In A Quick and Easy Way. 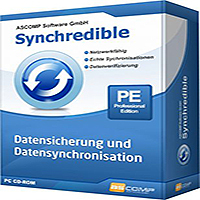 Whether it’s an individual file or an entire drive – Synchredible will synchronize, copy and save them for you. A software wizard will assist you to determine jobs that are either pre-scheduled or to be done through a USB connection. This way, you can keep your files in sync – automatically! Over the years, our state-of-the-art technology in Synchredible has made copying files easy. It also makes matching your files a simple task while it automatically detects changes and synchronizes the most recently edited files safely and reliably! Thanks to its advanced system for identifying similar files, Synchredible saves you time – unedited files may be skipped if desired. This way, large folders are synchronized in seconds!